So. I’ve been a slacker. A big one. BUT that’s not to say I haven’t been doing anything. In fact, for the past 4 weeks I have been learning a skill that will take me far in life. It has been tough, grueling, and time-consuming. Many will attempt, but few will find the will power to carry on and succeed. With the help of lessons and a guru, I have been able to create a piece of art with my newly attained talent. Watch out, world! I’m learning to knit! I bought my Mom and I knitting classes for Christmas and we’ve been on the journey to become knitting fiends! We’ve been going to Your Daily Fiber, where Ivy, our instructor, has been incessantly patient with us. 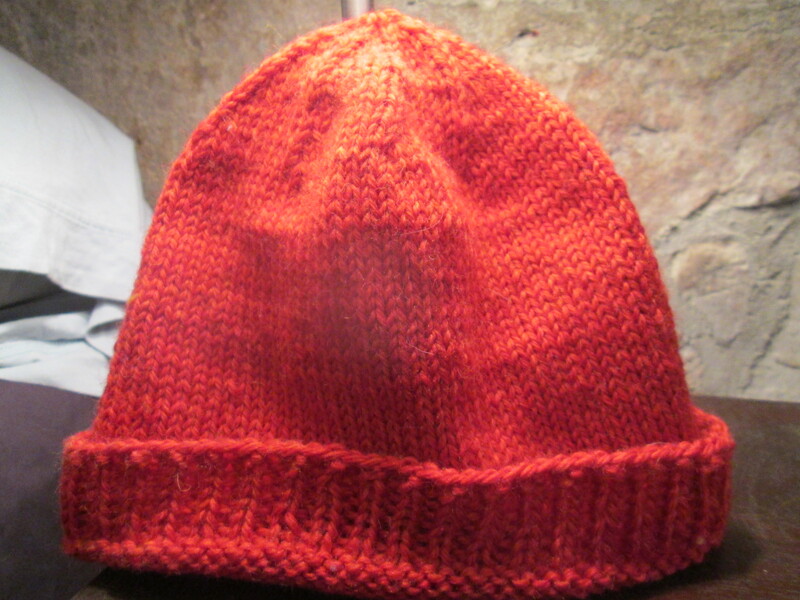 After 4 weeks, and many many MANY mistakes -and an impressive vocabulary of colorful words directed at the yarn and knitting needles-, I have finished my first project. My new work of art will be displayed for all to see…on my head. 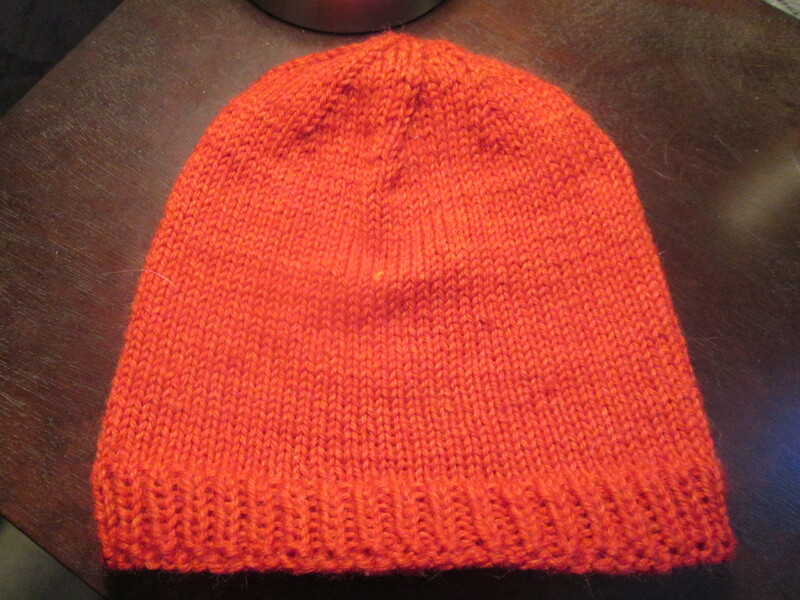 I made a beanie! Colorado has been so accommodating during this time by providing cold temperatures and several Spring snowstorms so that I might be able to actually wear it before we reach scorching Summer temps -in which case I will STILL wear it–. AND it’s bright orange, which makes it that much better. Diving into the knitting world, you have to learn not only a new language with your hands -how to hold the needles, what to do with the yarn, how to determine when you’ve dropped a stitch, how to refrain from giving your project the middle finger-, but also a new vocabulary. 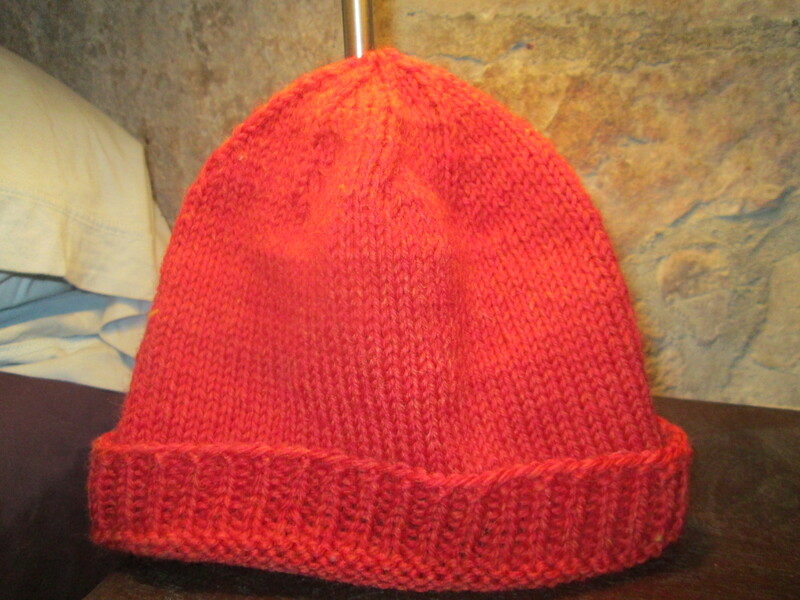 Purl, knit, turn, block, finish, sock stitch, rib, cast on, etc. I’m slowly catching on to these and am able to sometimes use them correctly so I don’t sound quite as moronic to our knitting instructor -who is amazing by the way…and did I mention very patient?-. I don’t know how to read patterns yet, so I just did what Ivy told me, which worked out pretty well for the most part. For this project, and for my particular stitches, I cast on 80, knit 1 purl 1 for 2 inches, knit in the round for 6 inches, knit 8 stitch 2 together for 1 row, knit one row, knit 7 stitch 2 together for one row, knit one row, knit 6 stitch 2 together for one row, knit one row….all the way down. Finish by sewing the top stitches together and bringing them through the top of the hat (I know what I’m trying to say, but not really sure how to say it. Obviously.). Sew in your yarn tails. If that made any sense to you, you are a knitting professional, because I just re-read it and it looks like gibberish. For my first project, I think it turned out pretty well. Because I’m still very new to this, I think I’m going to sign up for more classes so that I can learn to read a pattern, and hopefully learn to fix mistakes myself without completely crumbling and having a mild panic attack every time I drop a stitch. Although Summer is fast-approaching, you will be able to pick me out of a crowd. I’ll be the one in a tank top, shorts, sandals, and a bright orange beanie. And maybe socks, if I make those next. Project suggestions are welcome! I’ve already been encouraged to try my hand at knitted underwear….. This entry was posted in Arts & Crafts, DIY, Yarn Tricks and tagged arts & crafts, beanie, DIY, homemade, knitting, trial & error, yarn. Bookmark the permalink. Wow; yours looks soooo much better than mine…..good job!